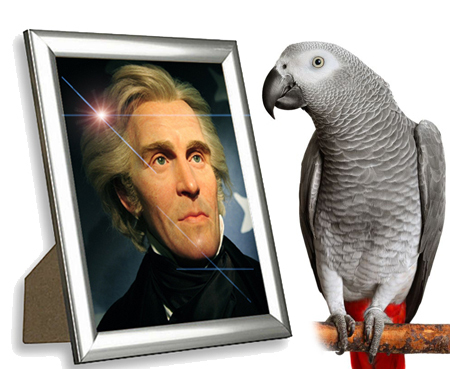 Andrew Jackson’s pet bird, Poll, swore like a sailor. The story of a presidential parrot cursing at a funeral is almost too unbelievable to be true. So we thought we had better check out the persistent story that President Andrew Jackson’s pet parrot started uttering obscenities during the former president’s own funeral and had to be removed. Parrots, intelligent birds that can live to be 75 years old, are known for their ability to learn words and to mimic other sounds they hear, including phones ringing and babies crying. Parrots do not have vocal chords but instead produce sounds by pushing air out of their tracheas. Jackson bought Poll, an African grey parrot, for his wife, Rachel, but took care of the bird himself after she died. Old Hickory was one tough man. Not only was Jackson a war hero, but when a man tried to shoot him at a speaking engagement and the gun misfired, President Jackson, 67 at the time, beat the would-be assassin almost senseless with his walking stick. Jackson outfitted the White House with a dozen spittoons, fought duels, and was the first president to open the White House for public visits. So it seems natural that his language might have been kind of, um, salty — but what did his parrot say exactly? No one seems to $%&! know. It has been nearly 50 years since a pet bird called the White House home. Andrew Jackson named one of his favorite horses, Sam Patch, after one of America’s first celebrities. Never heard of Sam Patch? Well, the original Sam Patch — a daredevil — certainly had his 15 minutes of fame. That first Sam Patch became a household name in 1829 after he leapt into the Niagara River near the base of Niagara Falls. In an event designed to draw visitors to the falls, a 125-foot ladder was built over the river. As luck would have it, about an hour before the man’s scheduled jump, the chain that secured the ladder to the cliff wall broke. Although Patch successfully made the jump later that day, the delay and bad weather caused the crowd to be disappointingly small. When Patch made a second jump a few days later, however, about 10,000 people showed up to watch. Unfortunately, the daredevil died about a month later, during yet another jump. Even so, Sam Patch and his trademarked slogan “Some things can be done as well as others” became so popular that when the city of Philadelphia gave President Andrew Jackson a white stallion in 1833, the president named him Sam Patch. Jackson, a noted horseman since his boyhood, became fond of his own Sam Patch, and a presidential portrait shows him astride the white horse. Sam Patch was one of the residents of the new brick White House stables Jackson had built during his presidency. His racehorse Truxton likely was another. Why did Jackson have new stables built? After the British burned the White House in 1814, a temporary wood frame stable was constructed near the rebuilt East Wing. James Monroe moved the stables near the West Wing in 1819. But when Jackson brought his collection of horses and racehorses to the White House, those stables were overflowing, so he asked Congress to approve construction of a freestanding brick stable trimmed with sandstone about 100 yards east of the East Wing, at a cost of about $3,600. Thruxton might have looked like this. Stock photo of vintage racehorse. 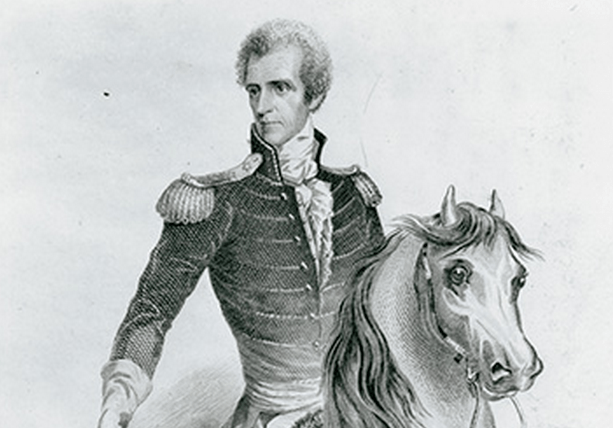 “Old Hickory” was a fitting nickname for our seventh president, Andrew Jackson, in more ways than one. The War of 1812 hero was known for his physical and mental toughness. But did you know Andrew Jackson had a disagreement over a racehorse that led him to fight in a deadly duel? Jackson was passionate about horses and horse racing. As a young lawyer — well before he became president — Jackson became famous as the leading breeder and owner of thoroughbreds in his native state of Tennessee. Interestingly, in the early 19th century, horse racing was the leading sport in the country. Tennessee alone had 10 established tracks by 1839. Jackson was part-owner of Clover Bottom, a track near his home, and he trained his horses there, including Thruxton, his prized Virginia born racehorse. 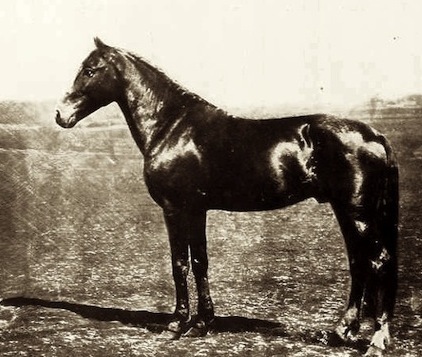 Thruxton, born in 1800, was sired by Diomed, a thoroughbred brought to this country from England, where his lineage was directly traced to the Godolphin Arabian. The famous gunfight over a horse. In March 1806, a match race between Thruxton and Joseph Erwin’s undefeated horse Ploughboy was canceled. According to the rules, Erwin was supposed to pay Jackson a forfeit fee. As the story goes, Erwin and his son-in-law Charles Dickinson disagreed with Jackson about the amount of the fee. In the midst of the ensuing argument, Dickinson insulted Jackson’s wife, Rachel. Things escalated until Dickinson wrote a letter to a Nashville newspaper calling Jackson a coward. That prompted Jackson to challenge Dickinson to a duel. It was Jackson’s third duel so far. Because Dickinson, age 25, had the reputation of being a good marksman, friends of Jackson, age 40, advised him to let Dickinson fire first in the hope that the first shot would not be fatal and Jackson could then take his time to return a shot. On the morning of the duel, Dickinson did indeed strike first, hitting Jackson in the chest. Jackson struggled but was able to hit Dickinson in the abdomen, and that wound proved to be fatal. According to Jackson biographer Jon Meachem, the over-sized coat Jackson wore may have interfered with Dickinson’s aim. Jackson’s doctors were afraid that they would kill him by trying to remove the bullet, and with the wound never completely healing and causing Jackson chronic discomfort, the bullet remained lodged near the future president’s heart for the rest of his life. 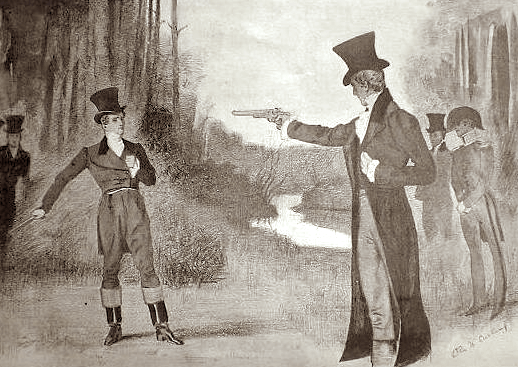 Many people criticized Jackson for killing Dickinson, but Jackson never apologized for the duel. As for Thruxton, Andrew Jackson’s racehorse, he was said to have accompanied the president to the White House upon election in 1828. Jackson had another famous horse named Sam Patch.